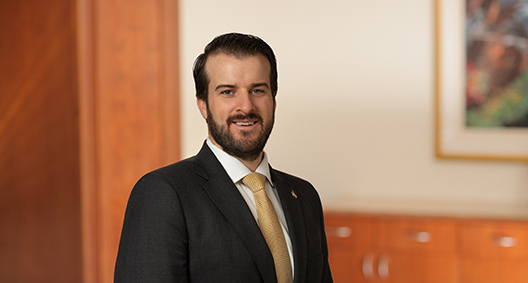 Alex Obrecht concentrates his practice on energy regulation and litigation, focusing on oil and gas development on federal lands, hazardous materials transportation and compliance, and oil and gas royalties. Having grown up and attended law school in Wyoming, one of the leading energy-producing states in the country, Alex adds a practical understanding to the complex legal environment in which his clients operate. Prior to law school, Alex worked with Credit Suisse, a Switzerland-based investment bank. During his tenure, he was involved in securities trading that occurred after the Macondo well blowout, which gave Alex insight into the corporate and financial aspects of issues affecting his energy clients. Secured a nationwide preliminary injunction and merits order invalidating the U.S. Bureau of Land Management's hydraulic fracturing regulations on federal and Indian lands. Secured summary judgment and affirmance on appeal for an independent oil and gas company in an antitrust suit related to natural gas development from coal bed methane deposits in the Rocky Mountains. Obtained reversal on appeal of an unfavorable district court order obtained by previous counsel for independent oil and gas company in federal royalty litigation. Obtained novel mandamus relief for independent oil and gas company because of the U.S. Bureau of Land Management’s failure to issue oil and gas drilling permits and to comply with the agency’s obligations under the Mineral Leasing Act. Counsel to a national oil and gas trade association in a challenge to the U.S. Bureau of Land Management’s compliance with its oil and gas lease sale obligation under the Mineral Leasing Act; defeated a motion to intervene by special interest groups. Counsel to a national agricultural trade association involved in efforts to review and prepare comments to Environmental Protection Agency's and United States Army Corps of Engineers' proposed rulemaking related to the Clean Water Act's definition of the "Waters of the United States." Counsel to an independent oil and gas company in an ongoing federal royalty dispute in the Department of Interior’s administrative appeals process and federal court litigation. Counsel to a midstream client developing a compliance plan with hazardous materials regulations for crude oil transportation. Counsel to an oil and gas wastewater treatment company. Colorado Royalty Litigation: 20 Dismissed Cases − Is There a Good-Faith Basis for Filing Such Cases in District Court? Obrecht Authors "Energy Policy Act of 2005: Pseudo-Fed for Transmission Congestion"
Served as counsel to a tenant in a breach of warranty of habitability dispute with a landlord. In conjunction with the ACLU, represented two women wrongly arrested and prosecuted for crimes during a 2013 "drug sting". The lawsuit settled with payment of $375,000 to the client. Member of U.S. Court of Appeals for the Tenth Circuit’s pro bono panel.